Designed to fit all manufacturer's wear rod configurations. Move your snowmobile on any hard surface with ease! Aluminum extrusion of superior strength. Corrosion resistant red anodized finish. Heavy duty 2" rubber swivel casters. Neoprene rubber strips for wear rod grip. 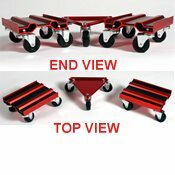 Dollies swivel a full 360 degrees for easy maneuverability. Made in the USA.